Patterns help us make sense of the world we live in. We see them everywhere, in the regular shape of a building, the arrangement of petals on a flower, and the symmetry of a snowflake. The natural tendency in nature is for things to break down and become disorganized over time, like the erosion of a mountain or the rusting of an old car. Patterns are signs of organization that help us to know that something important and special is happening. Whenever you see a pattern, that is a clue some interesting science behind it will help to explain why. 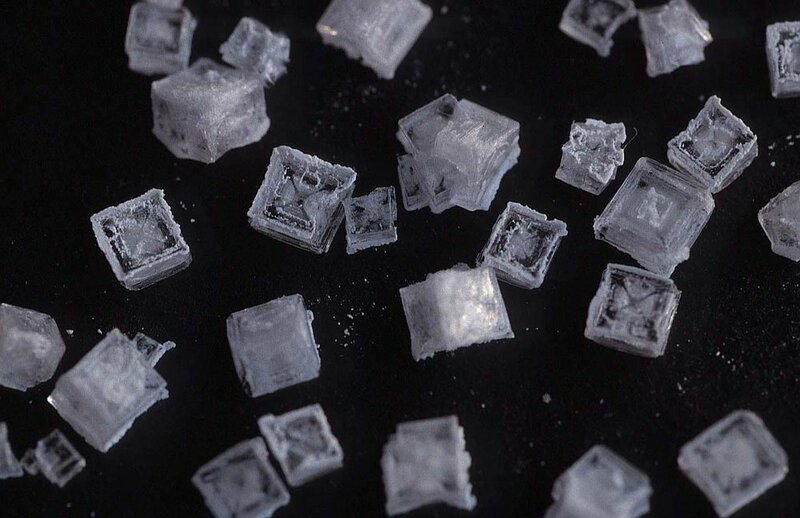 The regular shape of the salt crystals is caused by the arrangement of the atoms that make them up. Much of what we see in the world emerged from hidden structures that are not directly visible. Your DNA determines your traits - and explains why you are so similar to chimpanzees who share 96% of it. The arrangement of atoms in a water molecule (and bonds between them) determine the properties of water that we experience every day. The behavior of particles in a gas when it is heated or cooled determine important patterns in our climate and weather. You need to explore the unseen in order to understand patterns in the world around you. The orbit of the Moon around the Earth, and Earth around the Sun are patterns hinting at an underlying cause. 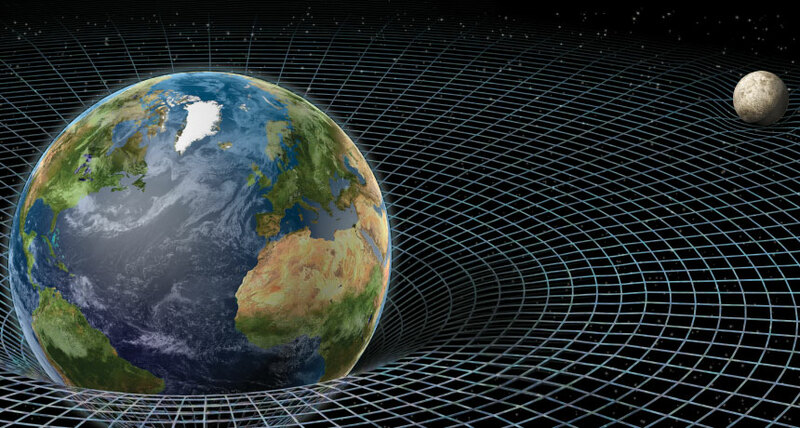 Gravity is a fundamental force of the universe. We see its effects everywhere in the world around us. By studying the patterns in these effects, we can uncover the nature of their cause. Sir Isaac Newton made important steps in describing the cause and effect relationship between gravity and motion in 1687. Often patterns can be seen when a graphic organizer is used. The periodic table is a graphic organizer that shows many patterns in the properties and behavior or elements. Visual presentations of data make it easier to spot patterns - and learn about nature. Humans are visual animals and presenting information as a picture helps us to understand what it is telling us. 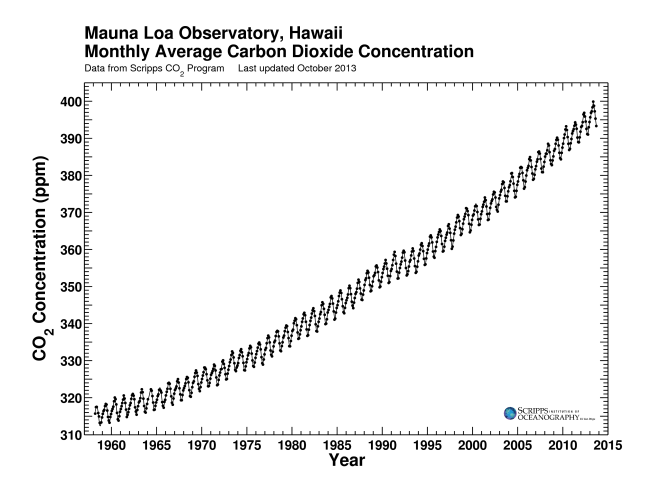 Carbon dioxide concentrations in the atmosphere are rising at an increasing rate. Combustion of fossil fuels adds carbon dioxide to the atmosphere and warms Earth's climate. The increasing slope of this curve shows that humans have not yet begun to slow their burning of fossil fuels with imporant consequences for our cliamte.